In December 2018, Kirsty Brimelow QC will conclude 6 years as Chair of the Bar Human Rights Committee of England and Wales. BHRC is hosting a special event in her honour and in celebration of her 15 years’ work with BHRC on 12 December 2018 at 18:30 at Doughty Street Chambers. 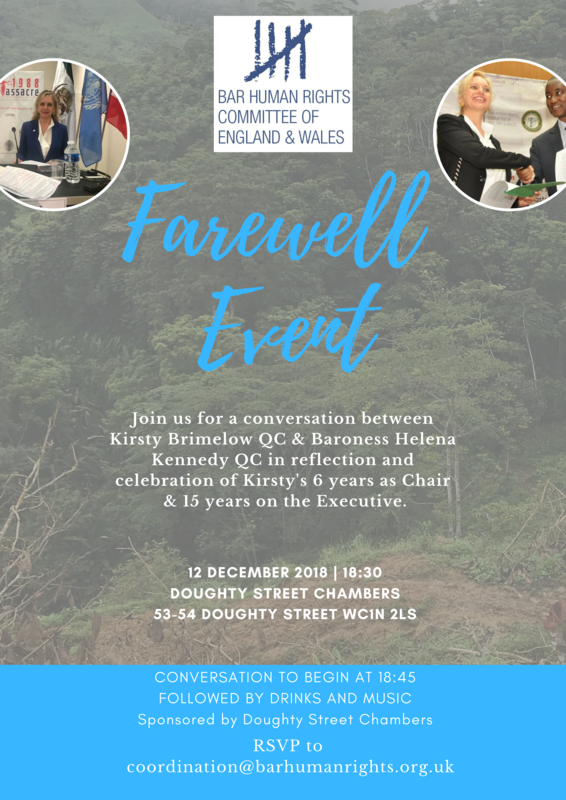 In conversation with Baroness Helena Kennedy QC, Kirsty will reflect on her experiences during her time with BHRC and look to the future of human rights. A drinks reception will follow sponsored by Doughty Street Chambers. All members are invited to join us in thanking and celebrating Kirsty’s inspirational work with BHRC. Please RSVP to BHRC Executive Officer Amanda June Chadwick at coordination@barhumanrights.org.uk by 7 December.